Register online for Winter 2019 classes! To register for a class please click on the “Register for this Class” button for the class you wish to register for and enter your information on the following page. You may pay by mailing a check to GRACE or with you credit or debit card via PayPal. We also offer a PDF form that you can print and mail to us with a check. Please contact us if you would like to apply for a scholarship for any class. Join the G.R.A.C.E. 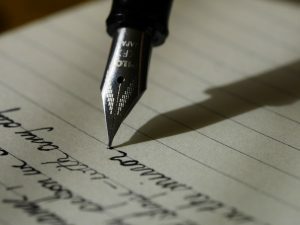 Writing Group to learn and practice writing techniques that will unlock the power of your writer’s voice, no matter what kind of writing you want to do. Learn how to help smother that editor in your head. Premature, compulsive editing makes writing difficult, dreaded and dead. The changes and pauses between your consciousness and the page damps down your voice. You have a sound, texture and rhythm to your voice that when unleashed creates powerful writing and makes a reader listen to you. You may not like your voice, but it’s the only one you have and your source of powerful writing. If you keep writing your voice will get better and you may like it better. If you stop writing, you’ll never have a voice and never be heard. Write nonstop 5 minutes a day then bring your favorite selection to our weekly group for positive, noncritical feedback. Your voice will love being set free and make you smile. 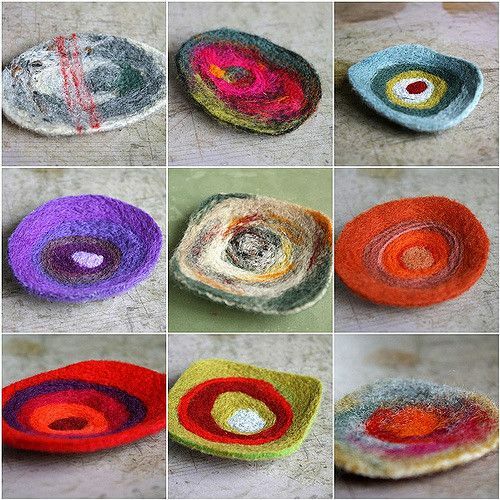 Working with templates, wool roving, and needles make a brooch pin, coaster or a mobile. Materials provided. 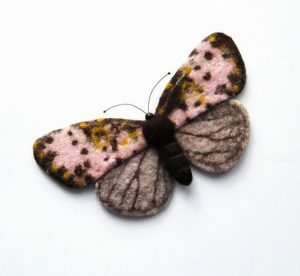 Needle felting is the process of interlocking wool fibres by stabbing it with a barbed needle. 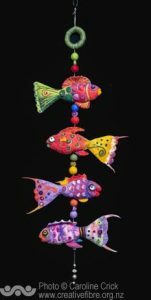 The barbs catch the scales on the fibre and cause them to tangle and bind together to make patterns, images or sculptures. Roving is wool that has been washed and run through a carding machine. When carded the wool fiber is all going in the same direction. Carding is like combing in that it is taking the fiber that is in small locks and combing it all smoothly together. The carded wool comes out in a long “roving” of wool that is easy to spin into yarn. It is also fluffy and easier to felt with as well. 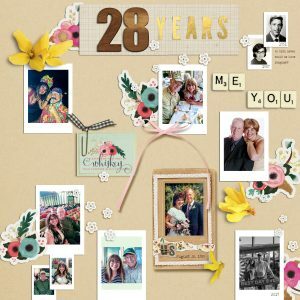 Scrapbooking is a method of preserving, presenting and arranging personal and family history in the form of a book, box or card. Typical memorabilia include photographs, printed media, and artwork. Scrapbooks can utilize fabric, paper, stencils, scrabble letters, pressed flowers and more to create a piece of artwork. 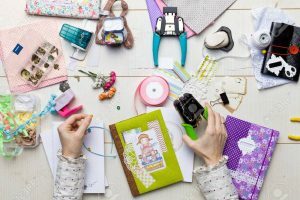 Students should bring personal items to scrapbook: mementos, photographs, recipes, invitations, etc. 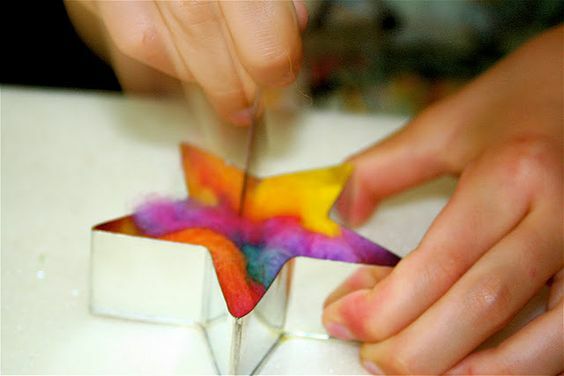 Materials provided: paper, dye cuts, stickers, markers, stencils, glue, colored pencils. Creating a 9 patch hand piecing square. Materials supplied, but you are free to bring your own fabric. Nine patches are a traditional quilt block made with nine simple squares. Three rows of three squares create quilt design that is versatile, traditional and trendy — all at the same time. 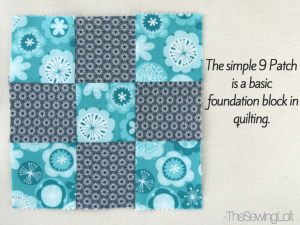 Today, most beginner quilt classes include a nine patch block. By choosing light and dark fabrics, and using them next to one another, a small checkerboard appears. There are no fancy tricks, or difficult techniques needed to make a wonderful simple block with so many possibilities. 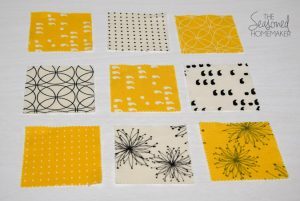 Because of this, nine patches are the perfect block for either hand piecing or machine piecing. Class limited to 5 students. In Coptic Bookbinding, participants will learn the whole process- from start to finish- to create a unique art journal. 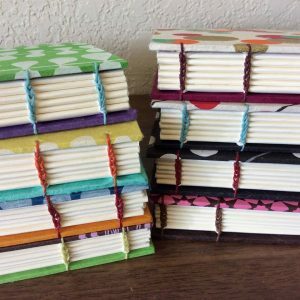 We will select beautiful handmade papers for the hardbound covers, and sew the open-spine binding using a traditional paired needle Coptic binding technique. 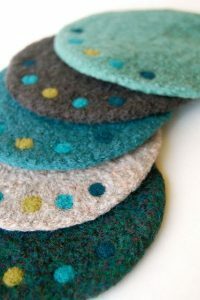 This form of Coptic binding creates a lovely chain stitch at every sewing station and results in a structurally strong book with high-quality mixed-media pages for writing, drawing, doodling, or whatever your heart desires! 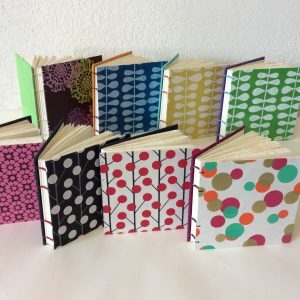 This promises to be a full-immersion experience in book-binding; participants will leave with a handmade blank book and a wealth of knowledge. 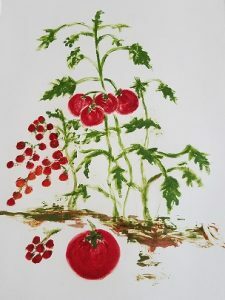 Bio: Nancy VanWinkle spent nearly a decade teaching adolescents in a land-based Montessori program; it was here that she started teaching visual journaling as a form of self-expression. Over time, her love of books grew and Nancy learned everything she knows about bookbinding from Asheville-based artist, Erin Keane, dynamic book-binder and encaustic innovator. Nancy has been honored to join Erin as her teaching assistant at both John C. Campbell Folk School and Penland School for the Arts in western North Carolina. A relatively new transplant to Vermont, Nancy teaches classes through local organizations and creates books in her home-based Nomadic Roots Studio, located in Craftsbury Village. Monotype is a unique combination of painting or drawing and printmaking. It is primarily one image painted or drawn onto a plate and transferred to paper. The image can be transferred by hand rubbing, rollers, rolling pins or an etching press. “The monotype is a singular image that cannot be replicated.” “The very nature of the monotype is it’s open, free quality which easily allows innovation (The Complete Printmaker by John Ross & Clare Romano). Students need to come prepared with ideas for imagery – photographs are helpful prompts. Materials provided include paper, brushes, pallet knives, oil based watercolors and oil pastels. Students are welcome to bring additional materials if they desire. We are now accepting new workshop contracts! The Old Firehouse is open 3 days a week, Tuesday through Thursday 10am-4pm.